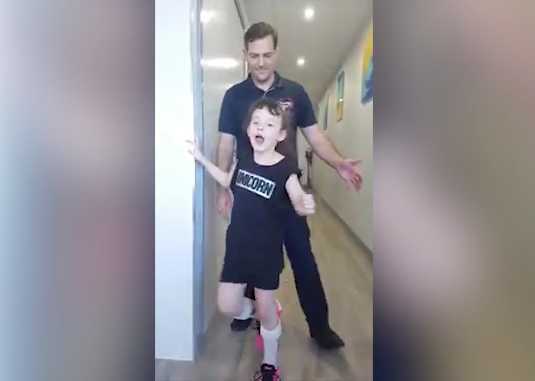 GOLD COAST — An Australian”miracle girl” who was stated to be 99.8 percent brain dead recently defied the odds and happily took her first steps without assistance. Mackinlee Anderson, 6, had been involved in a multiple vehicle accident in New South Wales last September, which took the life of her grandmother and injured her mother and brother. Anderson suffered numerous serious injuries, including a broken pelvis, a ruptured bladder, a dislocated hip, a broken femur, and most significantly, severe brain trauma. The neurosurgeon concluded that the girl was 99.8 percent brain dead. Doctors feared she wouldn’t make it, and said that if she did, she likely would never walk, talk or eat again. “We were pretty much in a place there where the doctors thought there was no hope for her,” her mother Kylee told Australia’s 9 News. She remained hospitalized for five months, and was then sent home to continue her recovery. Last week, Anderson began walking by herself. A video recorded by her mother shows the girl counting down and then taking off down the hallway declaring, “Walking is the best! Walking is great!” Her therapist follows behind, smiling. A Go Fund Me page that was set up to help cover Anderson’s medical costs notes that the girl had a lot of support and prayer.